Gutters and Downspouts need need to be in good working order to help protect from water damage. You want to be sure that following is given attention. Miter Joint leaks are a very common problem. 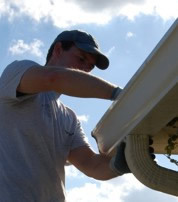 (See our FAQ) We will inspect your gutter system to identify any joint or seams that need attention. Then suggest the best method to correct the leak. Gutter that is "Sagging" will need to be given speacial attention. (See our FAQ) Gutter will began to "Sag" or if it is not properly pitched. Also if you gutter system was installed using inferior or improper fasteners over time they will begin to lossen and gutter will no longer carry water properly away from the foundation. We will access the situation and correct the pitch and add the proper fasteners. Gutter Downspous often are abused and missing the lower elbows. Without the elbow the water flowing from the downspout can cause a hole to develop in the area surrounding the foundation. This can lead to very serious water damage. We will be sure that that all elbows are properly attached to the downspouts and extending away from the foundation. A missing diverter or valley guard in will lead to to water overlowing the top of the gutter. Usually these are missing due to wind that has blow them off. We will replace any missing diverters or valley gurads and properly fasten any that are loose.